I am embarking on a mighty and noble quest. That’s right I am endeavoring to read the Discworld series by Terry Pratchett front to back. This no small feat. 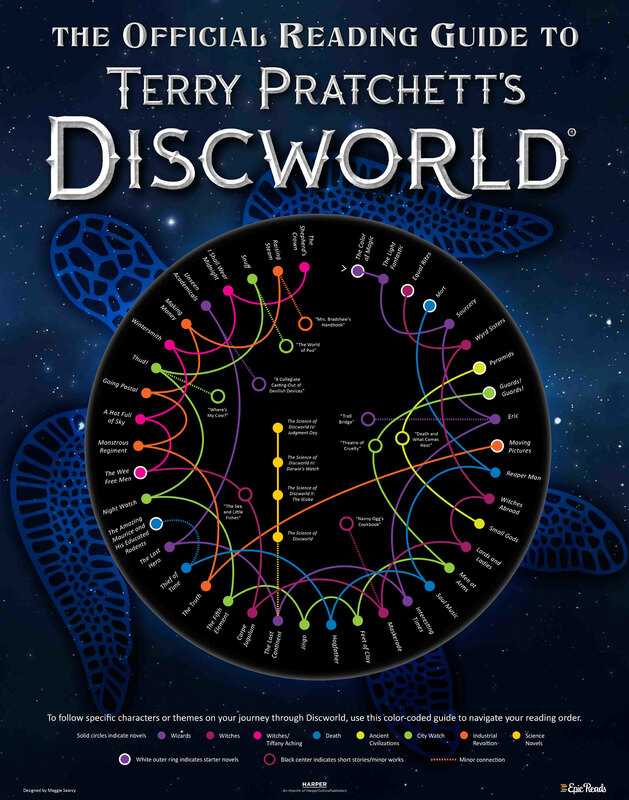 Pratchett wrote forty one books about the many different characters on Discworld. Using this infographic as a guide, I will set off to traipse through Ankh-Moorpork and beyond, hub to rim and across again. And at each stop, I will drop a review of the book I have just finished. Come along with me, on this adventure of laughs and groans and more laughs. But you can feel Pratchett trying to find his stride. And the book is funny. If there’s one thing Pratchett did not need to find it was his sense of humor. The play on words, the conversations where none of the participants seems to be understanding one another, and the sharp social satire is on display and on point in this novel. The novel introduces a myriad of characters which recur in later novels, my favorite of which are Rincewind an inept wizard who knows only one spell he can’t use, a sentient wooden trunk possessed of a hundred tiny feet with which it moves around, and my favorite of all Death. The story centers around Twoflower, the Discworld’s first tourist, who arrives in the city of Ankh-Morpork flush with cash and ready to spend it. He engages a hapless wizard on as guide and what follows is fire, dragons, barbarian heroes, hydrophobic wizards, trees bigger on the inside than the outside, and the great mystery of Great A’Tuin’s (the turtle on the shell of which the four elephant’s who hole Discworld on their backs) genitalia. Overall, this is a good read. Not as good as his novels will get, but well worth reading. PREVIOUS POST Previous post: Thanks for Flying on Over to the New Blog!